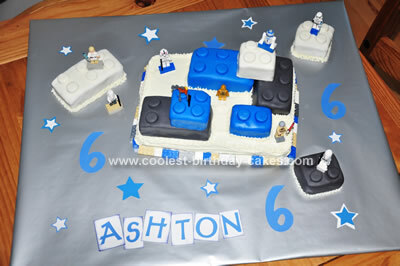 I made this Homemade Lego Star Wars Cake Design for my son’s golden 6th Birthday. He turned 6 on the 6th! He LOVES Lego Star Wars right now, so I knew that was the theme I wanted to go with. I’d never used fondant before and figured this would be a good time to attempt it. I did a little research online, but I wanted to come up with my own design and this is what I came up with. I baked 2 cakes…devil’s food cake (out of the box) each 9 by 13 size. The first one I cut up into big Lego block size pieces, then frosted just the tops of them (I tried frosting all sides, but it started falling apart). Then I pulled out my marshmallow fondant that I’d made a few days before and got to work coloring some of it blue, some gray and leaving the rest white. I used Wilton food coloring gels. Then I gradually rolled out small pieces to cover each Lego. Then I cut out the “dots” with a tiny cup kind of like an old film container and painted a little water on to get them to stick. 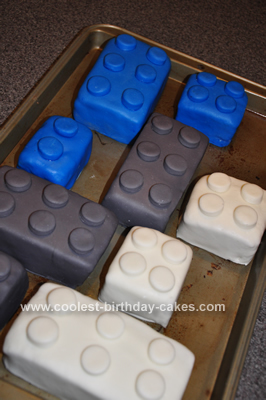 Next I frosted (with regular cream cheese frosting) the other cake and put real Legos all around the bottom, then gradually pieced together where I wanted the big Legos. To hide my imperfect bottoms of them I piped around them with a small star design. To finish it off, I added my son’s mini Lego Star Wars figures and added his name and stars to the cake board (that was a cardboard piece covered in silver wrapping paper). It actually turned out better than I thought it might! He and his friends LOVED it! Half of them even ate the fondant. I had to have a piece with real frosting. great cake!! my son’s 6th birthday is coming up and he loved this cake!! how did u make the Lego connector circles on the top? I made the little circles out of fondant…I cut them out with a little cylinder type contact case actually, but you could use an old film container or just find something in the shape of a circle about that size to cut them out. I looked for a tiny circle cookie cutter, but couldn’t find one. Good luck! Absolutely love your cake ! 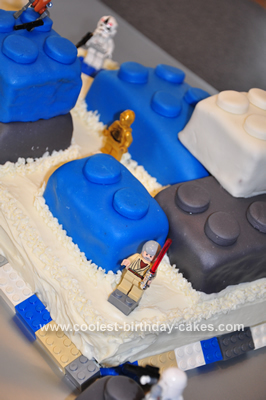 I’m doing a Batman Lego cake this week for a friend’s son… But, my grandson is a BIG fan of Star Wars, and the Star Wars Lego Wii game, so will have to keep this in mind…Thanks for the inspiration ! 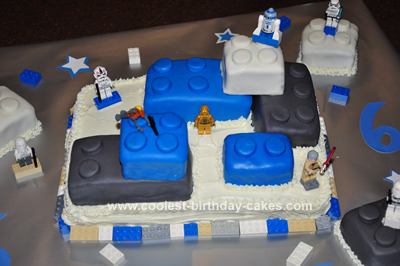 I’ve been looking for something lego and star wars for a while now couldn’t do it for last years b-day but this year he’s totally getting a star wars lego cake now that I see how easy it was you did it!